Persona 5, the game so good it got an honorary mention in our 2018 Game of the Year awards despite not coming out in 2018, has just received a new game teaser trailer courtesy of Atlus. 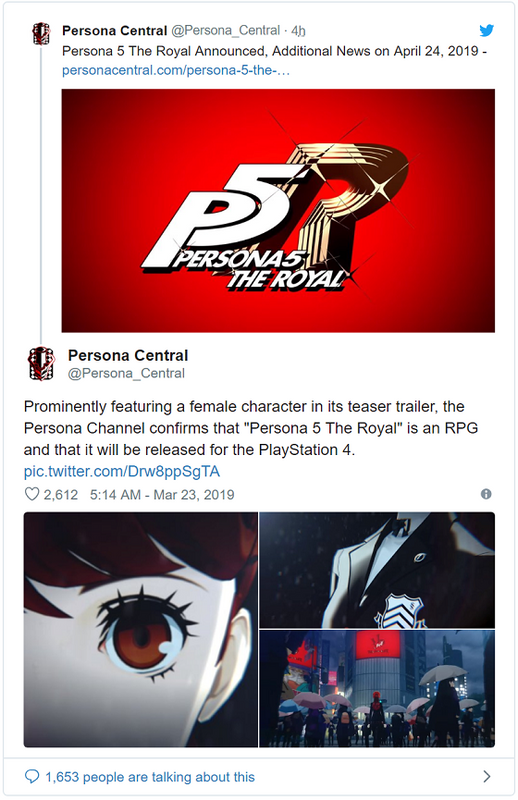 After the broadcast of the Persona 5 the Animation ‘Stars and Ours’ special, which wrapped up the endgame part of Persona 5, Atlus dropped a new teaser which reveals the full name of the rumored P5R game – Persona 5 The Royal. Sadly, there’s no indication that whatever Persona 5 The Royal is will be heading to Nintendo Switch, as the trailer opens only with a PlayStation 4 logo before changing into the usual Persona 5 branding. However, the trailer does appear to show off a new character – a young girl wearing a Shujin Academy uniform. Could this be the female version of the main character we’ve all been waiting for? Or is she someone entirely new? MysticDistance on Twitter translated the teaser, stating that it opens with a male character (presumably Akechi) asking the mysterious girl what she thinks of The Phantom Thieves. 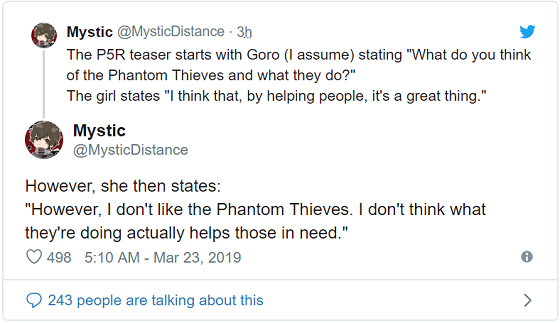 Her response is surprising – while she thinks helping people is good, she thinks The Phantom Thieves are actually bad people and what they’re doing doesn’t help anyone. We’ll have to wait until April to find out because that’s all the new information we have for now. More information will be released during the Persona Super Live 2019 concert on the 24th of April, 2019.